A secret twin kidnapped by a Faerie king . . . Hunting down the rogue vampire who killed her mother is Petra Maguire's sole mission in life, despite her father’s urging to serve her people back home in Faerie. But when Petra discovers she has a changeling twin who’s been kidnapped, she can’t avoid Faerie affairs any longer. Plunging back into a world of magic, royalty, and power plays, her daring rescue of her sister pushes inter-kingdom hostilities to a tipping point. And suddenly, Petra is up to her eyeballs in Fae politics. Tensions erupt into a threat of all-out war, and the only way to settle matters is for Petra to enter a battle of champions—a fight to the death. 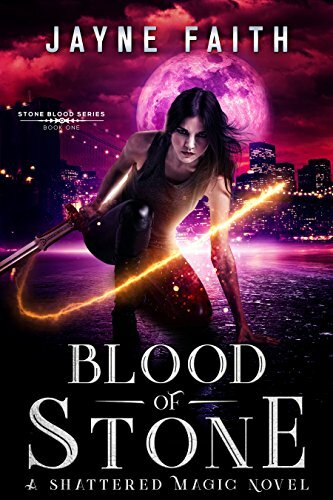 Find out what fate awaits Petra Maguire in Blood of Stone by Jayne Faith, the new urban fantasy hit for fans of Sarah J Maas, Ilona Andrews, Patricia Briggs, and Jim Butcher. Download Blood of Stone now and instantly lose yourself in a world of magic, action, and intrigue! More Urban Fantasy by Jayne Faith!